Calling all college basketball fans! The most exciting event in college sports will take the court in Minneapolis. Don’t miss the exciting conclusion of March Madness, when the top teams in college hoops converge in the Twin Cities from April 6 to 8. The NCAA tournament brackets were announced: Duke, Virginia, North Carolina and Gonzaga headline the pack, with the Duke Blue Devils as the top overall seed in the tourney. Want to be there for every minute of the action? Our Final Four Hotel and VIP travel packages will put you in the middle of the excitement. From luxury rooms at the finest accommodation in Minneapolis to an exclusive Chalk Talk with NCAA talent, TicketsatWork.com is your source for the ultimate Final Four experience. For the first time in its history, U.S. Bank Stadium in Minneapolis is this year’s home to the Final Four. This stunning multi-purpose stadium opened in 2016 to rave reviews from fans and players alike. The unique design features a Viking ship motif, an ode to the region’s Nordic heritage, and blends sustainability into the magnificent steel-and-glass structure. Be there when the Final Four makes its debut at this award-winning venue. Our packages include tickets to both games on Saturday and the big final on Monday evening. While you’re waiting for tip-off for the court action, you can swing by the Final Four Fan Fest at the Minneapolis Convention Center or stop in at one of the dozens of fun events throughout the downtown area. Other activities to check out include the March Madness Music Series, block parties and tip-off tailgate events. TicketsAtWork.com has four packages to choose from, including a Final Four Embassy Suites Package from $3,585, and a Final Four Hewing Hotel Package from $4,930. Check in to your luxurious room on Friday, April 5, so you’re in Minneapolis the day before the games start. Check out will be on Tuesday, April 9, the day after the championship matchup on Monday night. The Embassy Suites Downtown Minneapolis is located within walking distance of US Bank Stadium. These packages include a not-to-be-missed opportunity to meet NCAA talent! Learn more! Check out the 2019 Final Four Packages from TicketsAtWork.com. Along with our exclusive VIP Travel Packages, we also have game tickets during the epic Final Four weekend. See the two semifinal games that will decide who goes to the big dance on Monday, April 8. Whether you want to sit courtside or just want to be in the stadium for the thrilling atmosphere, TicketsAtWork.com is your connection to Final Four fun. It’s time to pack up the winter coats and start thinking about fun in the springtime sun. We are featuring excellent ideas for you to enjoy this spring with family and friends, including lots of outdoor events, theme parks, shows and exciting attractions. Plus, save up to 50% on spring break deals! St. Patrick’s Day is this Sunday, March 17! Available now through the 18th, now’s your chance to get lucky and save up to 50% with fantastic St. Patrick’s Day deals. From theme parks and lift tickets at the top ski resorts to music concerts, sporting events and restaurant gift cards, TicketsatWork has super savings. Springtime means breaking out your favorite flip-flops and swimsuit. TicketsatWork features savings for an awesome collection of water parks nationwide. 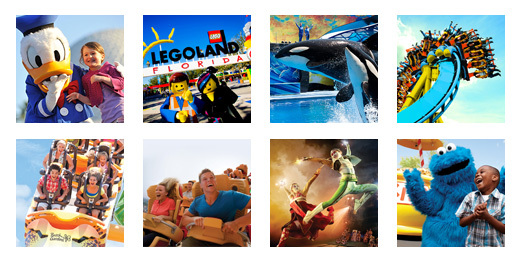 Save 30% at Rapid Waters in South Florida, and 40% at CoCo Key Water Park in Orlando. There’s also ticket specials for both Disney World water parks: Blizzard Beach and Typhoon Lagoon. It’s always a treat to catch a musical or play on Broadway or Off-Broadway when you’re visiting New York City. This spring, why not snap up tickets for just-opened shows or maybe one of the popular musicals that has been wowing audiences for years. Choose from a variety of productions including Avenue Q, The Phantom of the Opera, Book of Mormon, Wicked, Aladdin, and many more excellent shows in the Big Apple. If ever there was an act you just have to see to believe it’s the Blue Man Group, a joyful exploration of art, technology and music. A global sensation for 25-plus years, the Blue Man Group delivers an extraordinary spectacle. The 90-minute show is a lively and innovative combination of music, comedy, and multimedia theatrics that defies categorization. If you’re looking for a fun night out this spring in NYC, Chicago, Boston, Orlando or Las Vegas, buy tickets today with TicketsatWork and save. Have a blast spending a few hours with three mysterious bald blue characters. There is so much to see and experience at Universal Orlando Resort; now is the perfect time to visit! There’s also a new adventure coming to The Wizarding World of Harry Potter this summer. The all-new thrill ride, Hagrid’s Magical Creatures Motorbike Adventure, will open June 13 at Universal’s Islands of Adventure. Set to open for the season on March 23, California’s Great America has something for the entire family. The park in Santa Clara, CA, features countless rides, slides, attractions and live shows across 100 acres. Don’t miss the Easter Eggstravaganza on April 20 and 21, which features great Easter events for the kids. Gate Opening Sale – save over 50%! Visiting a zoo is a terrific way for the whole family to have a great time together. The animals, exhibits and educational tours are what make a trip to the zoo a perfect springtime activity. TicketsatWork features ticket specials for amazing zoos across the country, from the Birmingham Zoo in Alabama and Zoo Miami to popular zoos in Louisville, Nashville, Philadelphia and Maryland. Now this is a sensational addition to any sports fans’ bucket list. Take part in the excitement of March Madness at the Final Four in Minneapolis! Our VIP travel packages put you at the heart of all the basketball action. Highlights of our package include tournament tickets, luxury hotel accommodations and a VIP chalk talk hosted by NCAA talent. Enjoy a magical time in Anaheim, CA, at the Disneyland Resort, a wonderful travel destination for springtime fun. Throughout 2019, Disneyland offers a collection of adventures, festivals, shows, food and Disney character interactions. Don’t miss Star Wars: Galaxy’s Edge, an all-new land featuring Star Wars-themed attraction opening on May 31. There are also two family-friendly attractions opening at Pixar Pier. You can also be part of the culinary fun with unforgettable cuisine, beverages and events at the Disney California Adventure Food & Wine Festival, which is happening now until April 23. There’s also the new Mickey’s Mix Magic, an all-new nightly extravaganza bursting with magical song tracks, kaleidoscopic projections and exciting lights and lasers guaranteed to electrify your soul! St. Patrick’s Day is almost here, and TicketsatWork.com wants to help you find the pot of gold of big fun and great savings. If you are still seeking ideas for St. Patrick’s Day activities, check out TicketsatWork for savings up to 50% off awesome attractions and events. Enjoy a meal with family and friends this St. Patrick’s Day! With Restaurant.com, you get a great deal in three easy steps: Search for a restaurant near you, select the certificate and restaurant, then present at the restaurant for your savings. During our St. Patrick’s Day savings, pick up a $25 Restaurant.com certificate for only $3! St. Patrick’s Day is this Sunday, March 17. If you’re in search of fun entertainment options to help celebrate this weekend, then you’ve come to the right place because TicketsatWork.com has brewed up an exciting St. Patrick’s Day Sale! Set to run now through the 18th, this is your chance to get lucky: Save up to 50% St. Patrick’s Day Deals! From theme parks and lift tickets at the top ski resorts to music concerts, sporting events and restaurant gift cards, TicketsatWork has a variety of great savings from coast to coast to help make your St. Patrick’s Day extra special. Grab seats to a MLB Spring Training game or make St. Paddy’s Day plans to visit Walt Disney World in Orlando or Six Flags Magic Mountain in Los Angeles. There are ticket savings for musical superstars on tour, including Billy Joel, Elton John and Dave Matthews Band, and excellent dinner and brunch specials at top restaurants in Las Vegas, Miami, Chicago, Orlando and Houston. For the ski-lovers, TicketsatWork features lift ticket savings for 19 of the very best ski resorts nationwide – featuring some of the world’s finest skiing and snowboarding. Visit TicketsatWork.com today and Save Some Green this St. Patrick’s Day!